Time's running out for a unique gift idea to someone who has everything? 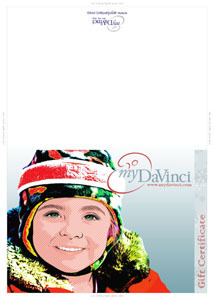 A myDaVinci Gift Certificate is the perfect solution! It will be redeemed for any personalized artwork that your gift recipient picks on myDaVinci, with 100% Money Back Guarantee. It never expires! Each certificate design shows a beautiful artwork created by our artists. Your personal message will be shown on the certificate image instantly. Enlarge the image to see details. Now you can make our "Love Trunk" design more personal to the gift recipient by adding names or sayings in the heart of the trunk, besides the "message" section. It becomes a unique gift for anniversary, wedding, engagement, and housewarming. Your gift certificate will be emailed to above address as soon as you place the order. Besides the redeem code, a printable gift certificate file is also provided for printing at home. Your gift certificate will be shipped to you. This one of a kind certificate (with folded greeting card style, size 5"x7") is printed on fine art paper and enclosed in a matching envelope. Purchase this image download for viewing, storing, and printing the artwork from your own computer. Hi-Def Digital Downloads are approximately 16x20 with a resolution of 300 pixels per inch. Standard Digital Downloads are approximately 8x10 with a resolution of 150 pixels per inch. This size is ideal for small-scale printing, such as greeting cards.